Sturt's Desert Pea was named after the early explorer, Charles Sturt. Sturt’s Desert Pea is the floral emblem for South Australia. It is a member of the legume family and because of its habit of growth and distinctive long and curiously shaped flowers it is highly ornamental. The flowers are usually coloured a scarlet or blood red with a central blue-black blotch or "boss" in clusters of up to six or eight which are held erect on a short stem above the plant. Variations in colouring are recorded from pure white to pink and through to purple. Such flowers may or may not possess the black blotch. The plant is picturesque and most attractive with its soft grey foliage produced on the many prostrate stems often up to 1 - 1.5 m in length. Flowers are produced every 10 - 15 cm along these stems and the plant in flower is beautifully set off by the attractive grey pinnate foliage. 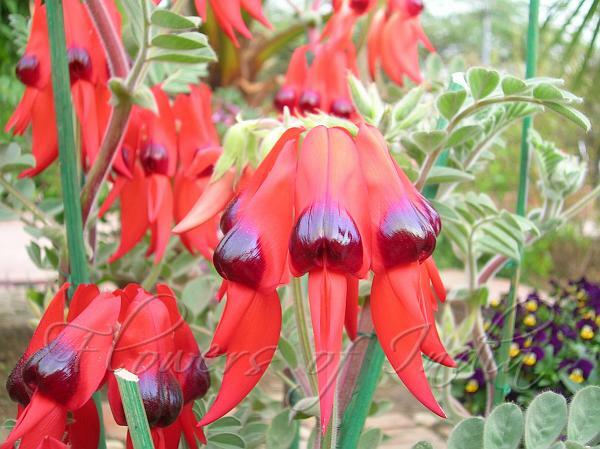 Sturt's Desert Pea can be grown readily in a very well draining potting mix or soil mix.